Abraham again tells a lie about Sarah being his sister as he suspected his life was in danger. No matter how much we love God, certain temptations are especially difficult to resist. These are the vulnerable spots in our spiritual armor. As we struggle, we can be encouraged to know that God is watching out for us just as he did for Abraham. We all see that God prevented Abimelech from sinning against Sarah. 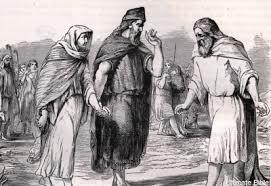 Like Abimelech we have no way of knowing how many times God would have prevented us from committing sin. God works just as often in ways we can. Then God said to him in the dream, “Yes, I know that you did this in the integrity of your heart; furthermore it was I who kept you from sinning against me. Therefore I did not let you touch her. Let’s Pray: Heavenly Father, we love you. We adore you. We have given ourselves in your hands. We acknowledge that we are weak and can falter at many things and situations. But you O Lord, are all knowing and by giving ourselves in your shelter, we are confident that you will protect us. Amen. 2Abraham said of his wife Sarah, “She is my sister.” And King Abimelech of Gerar sent and took Sarah. 4 Now Abimelech had not approached her; so he said, “Lord, will you destroy an innocent people? 6 Then God said to him in the dream, “Yes, I know that you did this in the integrity of your heart; furthermore it was I who kept you from sinning against me. Therefore I did not let you touch her. 11 Abraham said, “I did it because I thought, There is no fear of God at all in this place, and they will kill me because of my wife. 12 Besides, she is indeed my sister, the daughter of my father but not the daughter of my mother; and she became my wife. 14 Then Abimelech took sheep and oxen, and male and female slaves, and gave them to Abraham, and restored his wife Sarah to him. 17 Then Abraham prayed to God; and God healed Abimelech, and also healed his wife and female slaves so that they bore children. 18 For the LORD had closed fast all the wombs of the house of Abimelech because of Sarah, Abraham’s wife.